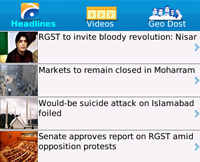 The official app for Geo News. Read latest news from Geo News (geo.tv) and Geo Dost (geodost.tv) on your mobile.Send videos and pictures directly to Pakistan's leading news channel. Watch latest bulletins (coming soon) from Geo Tv.